Are you planning to perform Umrah in the coming days? Look no further than Itimaar. With years of experience, Itimaar offers best Umrah package deals with competitive prices to our valued customers. We offer a wide range of flights for Umrah from world-class airlines, hotel reservations, 3 star, 4 star and 5 star Umrah packages for groups and families and multiple travel services. We are expert in designing customized Umrah packages and deals that fulfill individual requirements. Plan your holy pilgrimage to the cities of Makkah and Madinah with us and grab special offers, cheap Umrah flights deals at the cheapest prices. Because of our continuous efforts in providing the most budget-friendly, satisfactory and unique Umrah deals to our customers, we are one of the most trusted travel agencies in the UK. We also have tailor-made Umrah packages to fit various budgets and schedules, and assist you to obtain Umrah visa from the UK. Our focus is to make your journey blessed and convenient in every way. Keeping the price of Umrah deals at the lowest, we provide different Umrah services in every category according to the requirement of the travelers. With our economy , deluxe and super deluxe Umrah packages we make sure you easily find the deal that suits you the best. A reliable name in Hajj & Umrah travel, I’timaar provides the wisely crafted and the cheapest Umrah packages for pilgrims departing from the UK. Given our reputation for offering the best and the most cost-effective Umrah travel deals for individuals, groups and families, the trust and belief of our clients could be seen through excellent ratings on independent customer review websites such as Feefo, Google and our Facebook page. Our goal is to ensure that your travel and accommodation needs are fulfilled as per your expectations and your Umrah journey remains peaceful. Talk to our Hajj & Umrah experts to learn about our cheap Umrah packages and most affordable Umrah deals that are best suited to your travel and accommodation requirements. Book your Umrah package with I’timaar at a deposit of minimum amount. Call now! The significance of Umrah is clarified in this Hadith. The major and most eminent purpose of Umrah is to clean one’s soul from the sins committed in past. People booking Umrah tickets usually go on Umrah individually or in smaller groups. Seeing the rise of Umrah travellers, I’timaar has introduced newer Umrah packages in 2019 for your convenience. Umrah can be undertaken any time of the year, in contrast to Hajj which has specific dates according to the Islamic Lunar calendar. In Arabic, Umrah means ‘to visit a populated place’. In the Sharia, Umrah means to perform Tawaf around theKa’bah and Sa’i between Safa and Marwah hills. Umrah is also called ‘minor pilgrimage’ or ‘lesser pilgrimage’ and is a Sunnah performed at any time of the year except for the five days of Hajj However, it is not compulsory as Hajj, but it is highly recommended. Our UK Muslim clients have already begun their quest for Umrah and have started booking the best and cheap Umrah packages from UK. The primary requirement is that one needs to be a Muslim. The one performing Umrah must have pure intentions. The pilgrim should be of an appropriate age. The pilgrim should be able to afford all the expenses. Women who want to book Umrah tour to Makkah and are keen to go for Umrah must be accompanied by a Mahram (e.g. father, brother, husband, son). With years of experience in providing the Umrah packages, I’timaar should be your first choice if you want the best and cheapest Umrah packages 2019 from UK. We offer a wide range of services for Umrah tours including the international flights, accommodation and ziyarat of holy places. It is a dream of every believer to visit the holy Kaabah and perform Umrah, and I’timaar takes pride in fulfilling that dream in the best way possible. With a team of travel experts, we provide customized Umrah packages that take care of all your requirements and ensure a comfortable pilgrimage to the cities of Makkah and Madinah. Plan your Umrah 2019 with I’timaar and avail the best deals at cheapest prices. We are one of the most trusted travel operators in UK because of our constant effort to deliver the most unique and budget-friendly Umrah packages to our valued customers. Choosing a reliable Umrah travel agent is the most important part of your Umrah preparation as they help the pilgrims throughout the process of Umrah application, Umrah Visa process and making arrangements in Makkah and Madinah. It is extremely crucial for pilgrims to choose the travel agents which are registered with the Ministry of Hajj & Umrah. They should also be protected by Air Travel Organizers’ Licensing (ATOL) and certified by International Air Transport Association (IATA). I’timaar is ATOL protected IATA & ABTA certified and also registered with Ministry of Hajj & Umrah. Booking your Umrah package at least 3-4 months in advance is a good idea and quite beneficial in every way. Otherwise, it might get difficult to get cheap Umrah packages with good hotels and air tickets on time. By planning the Umrah tour ahead of time, you may get your desired arrangements without any compromises on quality and budget. Why book Umrah Packages with I’timaar? 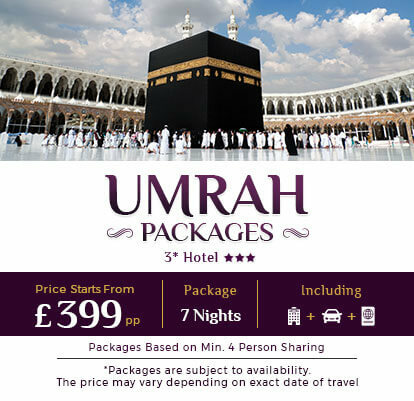 I’timaar offers a selection of carefully-crafted Umrah packages for Muslims of UK who want to embark on this spiritual journey. We take immense pride in the fact that we have assisted a vast number of Muslims in UK on their Hajj and Umrah tours, and gained their trust and confidence with our excellent services. We arrange the best available accommodation under your budget closest to Haram. Muslims who are planning to go on Umrah to the sacred land of Makkah, definitely need to manage some arrangements such as processing Visa, accommodation, transport and flights to reach Saudi Arabia and perform the holy rites of Umrah. The best option is to take the services of a reliable travel agent responsible for organizing and managing your Umrah trip. Covering every aspect of the tour, our special Umrah packages can be booked easily which provide the pilgrims peace of mind and safety of the investment. There are several types of packages available for the ease of pilgrims according to their budget and depending on the standard of services. These tailor-made Umrah packages are flexible and can be adjusted according to the requirement and budget of the pilgrims. The packages can also be customised according to a number of days the pilgrim plans to stay in Makkah and Madinah, the flight standard, accommodation and transport facility. Planning to book customized Umrah packages for yourself, group or family? Muslims from UK are increasingly opting for group Umrah packages which allow them to travel to Makkah for Umrah affordably. If you are interested in going on Umrah tour with your family or a group, just let us know your requirements and we will customize a package especially for you at the best price available in the market. I’timaar offers cheapest Umrah packages for 2019 from UK for individuals, families or groups starting from economy to luxury. Call our travel experts for details if you are looking for customized Umrah packages. We provide a range of 3-star, 4-star and 5-Star Umrah packages at the best rates possible, to match your budget and comfort level. I’timaar mainly offers three types of Umrah Deals; Individual Umrah deal, Family Umrah deal and Group Umrah deal. Pilgrims also have the option to hire a travel guide on their visit to the historical sites of Makkah and Madinah. Book an Individual Umrah deal with I’timaar if you want to perform Umrah solo. If one wants to go for Umrah with family, opt for our affordable Family Umrah packages. Our Group Umrah packages are perfect for you if you are planning to go with your friends and colleagues. This is the most popular type of Umrah package where you can share your expenses with 4 and 6 people in your group. When it comes to Hajj and Umrah tours, we aim to cater to all the needs and requirements of Muslims of UK. We are entirely focused on making your journey comfortable at every point and, ensuring that you have the most memorable trip. Our Umrah packages are planned carefully to fit every budget and schedule. I’timaar’s exclusive budget Umrah packages from UK include flights, accommodation and transport facilities. Our 31 years of experience in the travel domain enables us to provide the most reliable services and best Umrah package Deals in the country. Today, we are counted among the topmost Umrah service operators in UK due to our constant effort to provide the outstanding services and our uncompromising attitude when it comes to comfort and quality. We take full responsibility of arranging and administrating tasks related to our clients travel without any hesitations. Book your Umrah package with us without any worry and get ready to embark on the spiritual journey of a lifetime. Visit the sacred places of Makkah and Madinah with utmost peace of mind and count on us to plan the most memorable trip for you! We understand your need for peace and solitude on your pilgrimage to Makkah and Madinah, to completely dedicate yourself to the zikr and Ibadah of Allah (SWT). Trust us to facilitate you in every manner while planning your Umrah tour and booking an accommodation closest to Haram. We are directly linked with the service providers in Saudi Arabia which enables us to get the cheapest prices for accommodation and transport according to your needs and budget. We also ensure special arrangements for the physically-challenged person who want to undertake this spiritual journey so that their Umrah tour remains comfortable and hassle-free. Our vast range of hand-picked hotels in Makkah and Madinah offer a comfortable stay in close proximity of Haram and Masjid-e-Nabawi. We understand your requirements and your need to stick to the budget which is why our Umrah Special Offers include a range of 3-star, 4-star and 5-star Umrah packages to suit all your requirements. The weather conditions in Saudi Arabia are extreme so it is a good idea to choose comfortable and Luxury /Premium Umrah packages to make your trip easier. Our travel experts are proficient in assisting potential customers in making the best arrangements for Umrah in 2019 from booking flights to booking accommodation in the lowest rates possible. Book our group tours and family Umrah packages to avail special discounts. Call our experts for more details. That is why most Muslims prefer to perform Umrah in Ramadan. Likewise, Muslims in UK rush to book Umrah packages from London and various parts of the country to get the best deals and offers. Muharram & Saffar: Right after the end of Hajj season comes the month of Muharram and Saffar when the prices of hotel accommodation slash down, so these months are a great time for people interested in performing Umrah to book the packages for. It is also the beginning of the new Islamic year so your visa application will be fast-processed and the formalities will get completed within a short duration. Mid-year Vacation: If you prefer to go on Umrah with your family or group then, go on Umrah during the mid-year vacation. Most people are busy with their studies or jobs the whole year except in the vacation. Therefore, mid-year vacation is a great time for the whole family to go on a holy expedition but book your tickets in advance because it is a busy time for Umrah. Winter: The weather conditions in Saudi Arabia are extreme with scorching hot and humid days and cold nights. The temperature remains high during most months in Saudi Arabia except in winters (November to January). Therefore, winter time is good for Umrah as you are able to perform all rituals easily and without any hurdles. Contact our Umrah travel experts for the best Umrah packages for winters! Five points around Makkah are used as Meekat for assuming Ihram. Men’s ihram consists of two plain and white sheets of cloth while women are permitted to wear normal clothes but they cannot cover their hands and face. After assuming Ihram, pilgrims are required to make intention for Umrah and recite Talbiyah until they reach Kaabah. After entering Haram, lift your hand to the direction of the black stone (Hajri Aswad) and say Allah-hu-Akbar and start performing tawaf i.e. circumambulating the Kaabah seven times. Upon completion of tawaf offer Nafl at Maqam-e-Ibrahim. Afterwards, move to the hills of Safa and Marwah to perform Saa’ee. After completing Saa’ee i.e. the seven circuits, pilgrims are required to cut/trim their hair. This completes the Umrah. For more information regarding how to do Umrah and important tips to perform Umrah, visit our Umrah Guide section. Umrah Tips: How to prepare for Umrah ? Before reaching the Meeqat, it is recommended to take Ghusl, the bath of purity. After the ritual bath, men can put perfume and wear the two sheets of clothes of Ihram. The women are prohibited to use any fragrances during the Umrah and Hajj. After assuming Ihram, it is recommended to perform two raka’t nafl prayers after which, pilgrims are required to make intention for Umrah. The condition of Ihram clothing is different for women. They can wear their ordinary clothes which match the rules of Hijab. Once the pilgrims enter the state of Ihram, men pronounce Talbiyah loudly but the females have to keep their voices low. Both should keep reciting Talbiyah throughout their way to the Kaaba. Women are required to be accompanied by a mahram (son, husband, uncle, father, nephew or likewise) and cannot go for Umrah or Hajj without him. According to British law, the minimum age for accompanying a female for Umrah is 18 years. A woman on Iddah cannot perform Umrah. Women are also not allowed to perform Ramal or recite Talbiyah loudly. If there is a large crowd of men near the Kaabah, women should maintain a distance. They may offer Nafl salah anywhere in Masjid-ul-Haram if there is a rush on Maqam-e-Ibrahim. What are the Visa Requirements for Umrah? Individuals are not allowed to apply for Umrah visa directly and it can only be acquired through Ministry of Hajj & Umrah approved Umrah travel agents in UK. Visas are granted by the Saudi Government free of charge but the travel agents may charge an administrative fee. Umrah visa is only valid for travel in the region of Jeddah, Mecca and Medina, and the violation may result in penalties. Females must be accompanied by a mahram i.e. husband, brother, father, son, uncle, nephew or likewise, and the mahram should be at least 17 years of age. Is any Vaccination required before commencing your journey for Umrah? Flights from London for Umrah include British Airways, Saudi Airlines, Gulf, Etihad, Lufthansa and Oman Airways. 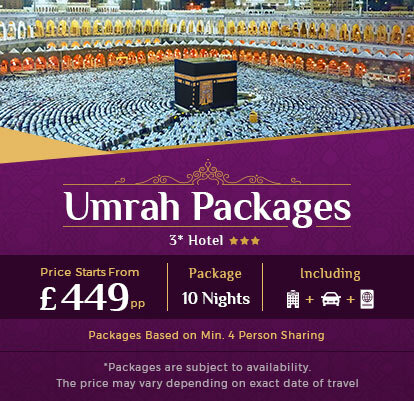 I’timaar offers cheap Umrah Packages 2019 for individuals, Families and Groups Including Flights from London, Birmingham, Manchester, Leicester, Bradford and Leeds. Airlines flying to Jeddah from Birmingham include Air France, Turkish Airlines, Lufthansa and Emirates. Connecting flights are available for Umrah via London. To Book Cheap Umrah Packages 2019 For Family And Groups including cheap Flights to Jeddah from London, Birmingham, Manchester and Glasgow, call our travel experts now! The baggage allowance varies from airline to airline. While Saudi Airlines allow two bags of 23 kg each and hand luggage up to 7 kg, other airlines such as Qatar Airways, Emirates, Gulf Air and Etihad Airways allow 30 kg with 7 kg hand luggage. According to new Saudi Government laws, a person can carry up to 5 litres of Zamzam which can also be purchased at the airport. What are the facilities for Umrah 2019 UK pilgrims on Jeddah international airport? There are separate entry and exit points for Hajj and Umrah pilgrims at the Jeddah airport. With world-class facilities and state-of-art infrastructures, King Abdulaziz airport is a fantastic example of modern engineering. Counted amongst the top airports of the world, it is constructed of Teflon-coated fibreglass to resist the extreme climatic conditions and, gives out the impression of a large Bedouin tent. The airport can accommodate up to 80,000 Hajjis at one time and meet their needs during the long waiting hours. In addition to the cafeteria and restaurants, the airport also features cooking space (for pilgrims to cook their food), ablution facilities, prayer room, space for changing into ihram, sitting & napping space, and even marketplace for pilgrims to sell stuff to fund their trip! I’timaar’s all-inclusive Umrah packages 2019 include airport and hotel transfer. Transportation to the cities of Makkah and Madinah is also included in your planned itinerary. If you want to travel on your own, you can do so too. You can also opt for private transportation like car or taxi for travelling to Mosques and other holy places. Counted among the best Umrah tour operators in UK, I’timaar not only plans the best Umrah packages for you but also includes ziyarat to important sites around Makkah and Madinah bearing significance in the Islamic history. Visit to Masjid-e-Quba is a must which is also the first mosque in Islam after Masjid Al Haram. You are also recommended to visit the caves of Thawr and Hira in addition to the houses of a number of Sahabas (RA). On your Umrah tour also visit Masjid-e-Qiblatain, Masjid-e-Jumma and Janatul Baqi in Madinah. Buying souvenirs and gifts for friends and family back at home is also a common practice among the pilgrims. You can get prayer mats, beads, dates, mosque replicas and jewellery to take back home for your dear ones. I’timaar is the most trusted Umrah tour operator in UK that has been fortunate enough to be part of Umrah journey of scores of Muslims of UK. It is recommended to book Umrah packages in advance to take advantage of the numerous discount deals and slashed prices. We provide complete assistance to book your Umrah package in advance for the year 2019. Browse through our cost-effective Umrah packages 2019 if you are planning to go on Umrah next year. Talk to our Hajj & Umrah travel experts to know about the latest Umrah deals!